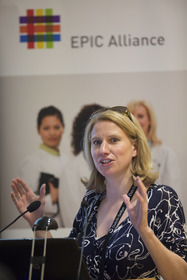 BERLIN--(Marketwire - Sep 10, 2012) - Female electrophysiologists from around the world gathered on August 28th, 2012 at the European Society of Cardiology Congress to attend the EPIC Alliance's scientific session: "The Heart of the Matter." The EPIC Alliance (Electrophysiologist International Community Alliance) is a global network of female electrophysiologists that has been supported by BIOTRONIK since 2008 to address the staggeringly small number of women working in the field. Through various programs, internationally conducted meetings and clinical study opportunities, the alliance aims to increase the number of women working in electrophysiology. The group currently consists of 100 female electrophysiologists from around the world and is the only alliance of its kind that champions women in electrophysiology. The EPIC Alliance's scientific session at the ESC Congress was chaired by Professor Jeanne E. Poole (University of Washington, USA) and Professor Carina Blomström-Lundqvist, (University Hospital, Uppsala, Sweden). Well-known electrophysiologists presented new research with a special focus on gender-specific topics. Dr. Sabine Ernst (Royal Brompton Hospital, London, UK) talked in her presentation "Working in the EP lab: Radiation risks to you and your patients" about how radiation exposure is a significant concern in the medical community. Using data from research supported by the EPIC Alliance, Dr. Ernst's findings were presented in two posters at the congress. "Radiation exposure remains an occupational health risk for interventional cardiologists and recent research shows that cardiologists may suffer from an increased risk for genetic damage over time," Dr. Ernst explains. "However, there are simple steps and safety measures, such as taking care of adequate protective shielding as well as lowering overall exposure time, which will prevent unnecessary radiation exposure for patients and operators." Professor Silvia G. Priori's presentation at the scientific session addressed gender differences in inheritable disorders and discussed how gender is an undisputed modifier of the expressivity of inherited arrhythmogenic disorders. Professor Priori (University of Pavia, Italy) is a recognized pioneer in the field of inherited cardiovascular diseases and a clinical cardiologist who has achieved global recognition for her work on inheritable diseases. Professor Priori's research aims to identify gender differences in cardiac disorders which will pave the way for new diagnostic techniques and treatments in the future. Dr. Andrea Russo, Professor of Medicine at Cooper Medical School of Rowan University (Cooper University Hospital, New Jersey, USA), presented findings about the benefits of implantable cardioverter defibrillator (ICD) therapy in women. Dr. Russo investigated the gender differences in epidemiology and presentation of sudden cardiac arrest. She concluded reasons for gender differences in ventricular arrhythmias and potential differences in the impact of device therapy on outcome are currently unclear and warrant further investigation. In addition to the scientific session, the EPIC Alliance held a networking dinner to give members the opportunity to discuss topics ranging from career development and research to advice related to achieving a healthy professional and private life balance. "BIOTRONIK is committed to excellence in cardiology and electrophysiology, which is why we believe it is important to continuously discover and promote talent. Science and medicine cannot afford to have gender inequality and undiscovered talent in the field of electrophysiology, which is a growing but still a small discipline," explains Christoph Böhmer, President International, BIOTRONIK. "To address this imbalance, the EPIC Alliance aims to raise awareness of opportunities available for women in electrophysiology and to overcome hurdles that hinder them from starting a career in this field of work. We support the EPIC Alliance as it offers a great platform for women in this profession to establish international contacts, network on various levels and discuss important research topics."